We provide a full line of estate sale services— when you need to sell the entire contents of your household, fast! Our comprehensive "broom swept" cleanout service lets you relax while we do all the organizing, selling, and clean up! Looking to sell a single object, or maybe even an entire collection? We're always looking to buy quality items! Settling in Massachusetts from out-of-state? Let us handle your home's contents, and manage the process for you! Contact us now for a confidential consultation regarding your needs! 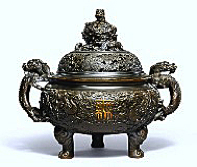 A trusted buyer of Chinese Art and Antiquities, as well as Fine Art, Silver, Oriental Carpets, Jewelry, Furniture, Folk Art, Native American, and More! We offer fair market value for quality antiques and decorative arts — single items or entire collections. Check with us before sell! We can handle the entire contents of your home, fast! Expertly organized estate sales and estate liquidation services, including purchase of Chinese art and antiques, with over forty years of experience.